Mara seems to be getting that age that she knows who she recognizes and knows who she does not. I guess its our hope that we can make her accustomed to be held by various people, but its probably inevitable for that not to be the case. This weekend Grandma and Grandpa came in for a visit on their way to Wilmington. This is their 2nd time seeing Mara. They came in Friday afternoon and just left this morning. Mara had mixed reviews if she liked being held by anyone but Mom or Dad. 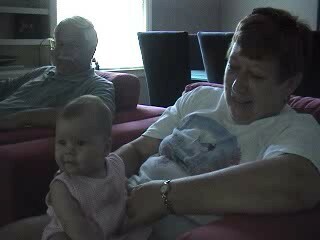 We were able to get some video yesterday of a good moment of Grandma holding Mara on her lap. Mara seems to begin to recognize her. Take a look!